I’ve heard about how a hungry teenager can eat everything in the house, and now I’m experiencing it firsthand. My son isn’t even a teen—just 12—but over the last six months, he’s grown three inches and put on 20 pounds. I used to think my husband could eat a lot, but our son can easily eat double or triple what his dad can eat. Then an hour or two later, he’ll tell us he’s hungry again. If you have a tween or teen, this may sound all too familiar. However, we don’t really have enough room to raise the grocery budget, so we’re finding creative ways to keep him full. Protein. Meat can be expensive, but growing teens need protein to help them feel satiated. We make sure to serve an ample serving of protein at breakfast and during every meal. Some of our favorite breakfast proteins include homemade meat patties, eggs, or bacon. Healthy Carbs. Three staples in our teen’s diet are white potatoes, sweet potatoes, and rice. He often eats rice with breakfast, homemade baked French fries for lunch, and baked sweet potatoes for dinner. These carbs help fill him up and round out his meal. After he eats an entire plateful of food and is still hungry, we give him vegetables and one of these carbs. Fruits. These are a great way to fill up hungry teens, especially in between meals. I find that grapefruit is my best bet. It’s not that expensive, and it’s large and watery, so it fills him up. Other options include apples, pears, bananas, oranges, or whatever other fruit you have on hand. I always buy a lot of fruit when doing my weekly shopping. Veggies. Vegetables are another choice that aren’t that expensive. Organic carrots are .50 a pound at Costco. We buy the ten pound bag and prepare them as raw carrot sticks or as roasted carrots. Whenever a vegetable is on sale, I stock up and make extra knowing that our son will have multiple servings. Fat. Healthy fat can definitely help fill up a teen. We’re big fans of avocado. We often make guacamole to serve with our salads and soups. We also serve it as a snack with organic corn chips. Coconut oil, coconut cream, and coconut milk are also great ingredients to use in muffins, smoothies, and desserts to help satiate your child. Junk Food. I know, I know, teens love this stuff. But the truth is, they can wolf down a bag of Cheetos or chips and then be hungry just a little later because they were eating empty calories. We like to keep the junk food to a minimum and rely on healthy staples instead. In the long wrong, when it comes to teen appetites, healthy food IS cheaper. Plus, you’re helping your child maintain a healthy lifestyle. Fast Food. The stereotype has teen boys living off fast food. While it is temporarily filling, if your child relies on this type of food frequently, he may be facing health issues down the road. Our family has a number of food intolerances, so we can’t rely on other staples that will help fill kids up like peanut butter and jelly sandwiches or cottage cheese, but those are also fairly nutritious options. 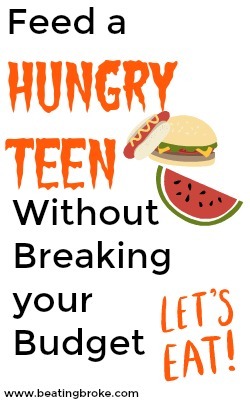 What are your favorite foods to help fill your growing teen’s bottomless pit? Please share. Do you have a budget that already feels tight? Have you cut and cut but still have more month than money? 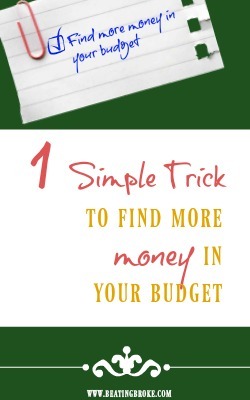 Are you struggling to find more money in your budget? I know how that goes. Over the last few months, my husband and I have been working hard to cut our budget as much as possible. We thought we’d cut all that we could, but I discovered one more secret, which, depending on your budget could help you “find” another $20 to over $100 a month. So what’s the magic secret? Make your payments on a semi-annual or annual basis rather than on a monthly basis. Find more money in your budget. We have Ooma for our home phone line. I pay $17.99 a month. Recently I had to call Ooma because I was having an issue with the service. After the customer service rep had finished helping me, she asked if I wanted to pay annually instead of monthly. An annual payment would be $105, the equivalent of $8.75 a month. In other words, I was paying an additional $110.88 a year for the convenience of monthly payments. Our life insurance is the same. When I checked into it, I realized that we would save $22 a month if we paid annually instead of monthly. We already pay our car insurance semi-annually, but if we opted to pay monthly, we’d be charged a $2 per month fee. Other car insurance companies charge as much as 5 to 10% more for a monthly payment. Take a look through your monthly bills. Are there any that you can choose to pay annually or semi-annually? If so, how much will you save per month if you pay annually instead of monthly? In our case, we “found” an extra $32 a month. Sure, that doesn’t sound like a lot, but over a year, it adds up to an additional $384 we now have that we didn’t have before. Before you change your payment method, it’s important to consider two factors. First, if your budget is already tight, you may need to wait to switch to an annual payment until you have a windfall like a bonus at work or an income tax return. If you’re used to paying $80 a month for car insurance, even with a discount for paying annually, you may still be looking at paying $800 or $900 in one swoop, which can be difficult on a tight budget. Second, only use this method if you know you’ll be disciplined enough to set aside money every month for the annual payment. If your annual car insurance is $800, then set aside approximately $65 a month so you’ll have enough to pay the annual payment when it comes due. Making payments annually or semi-annually can be a great way to find extra money in your budget, but before you change to this method, make sure that you have the discipline to set aside (and not spend) the money each month for the annual payment. Do you pay bills like your insurance monthly or semi-annually or annually? Which do you prefer? Why? When you’re in debt, it’s easy to be hard on yourself. You shouldn’t have let yourself go into so much debt. You weren’t smart with your money. You’re not paying off the debt fast enough. On and on we berate ourselves. It’s even easier to do this at the end of the year when you feel financial pressure to buy gifts for not only family members, but associates, hired help, etc. In addition, if you’re anything like me, you may have set some lofty goals last January that you could not achieve. Last January, I could see nothing but clear horizons. I set some ambitious financial goals (for our financial situation). I wanted to put at least $3,000 in our emergency fund. I wanted to save $1,000 for a family vacation. I wanted to save $3,000 for a new-to-us car. Guess how many of those financial goals I accomplished? None! Guess how many I partially accomplished? None! What I could not see that fine January morning when I set my goals was that we were on the precipice of a financial cliff. Within just a few weeks of setting the goals, we experienced a number of financial difficulties. My husband had to get a root canal and a crown at the cost of almost $600. I had to see a periodontist and several dentists for a cyst on my gum that finally resulted in a root canal in April and a corrected filling. The cost of all the treatment was approximately $700. Our car needed a $1,500 repair. Our car needed new tires. $700. My son needed braces. We saved and paid the first $900 out of pocket. In a few months, we’ll need to come up with another $900, and then we’ll be on a payment plan with zero interest for the rest. Our 18 year old A/C unit was leaking Freon, causing one electric bill to be $150 more than normal, and we also paid $200 to have it serviced for a grand total of $350. In short, this year was a financial disaster as far as paying off debt went. This year was all about financial survival mode. And that’s okay. Some years you can’t be gazelle intense or even pay any extra on your debt because you’re too busy just surviving. Even though the year didn’t go the way we had planned, at all, it wasn’t a complete wash financially. The good news is that we learned more creative ways to stretch our money even further. We’ll continue to implement those strategies this upcoming year. The even better news is that we didn’t acquire any new debt. Sometimes, treading water is the best you can do. Overall, for this year, I’m happy with that. 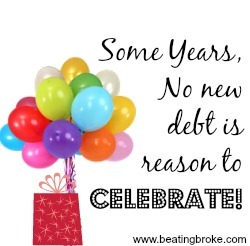 If you’re paying off debt, did you make the progress you wanted to this year, or did you have a year like ours?